After two days of intense on-track action, this Sunday was all about final showdowns for the four categories in the second round of the 2018 WSK Final Cup. Disputed under heavy grey clouds and on a half-dry, half-wet 7 Laghi Circuit, the four Finals went respectively to Marcus Amand (OKJ), Ean Eyckmans (60 Mini), Adrien Renaudin (KZ2) and Dexter Patterson (OK). 202,Patterson Dexter(GBR),Kr motor sport(KART-REPUBLIC/PARILLA/BRIDGESTONE), Castelletto, 11 November 2018. WSK Final Cup, © 2018, Alexandros Vernardis / The RaceBox. After struggling to find his pace and place both during Qualifying and the Heats, Marcus Amand (KR-Parilla) found the magic formula on Sunday to win the second round of the WSK Final Cup in the Junior class. Winner of the Prefinal B with an impressive 3.7-second margin over Gabriele Mini’ (Parolin-TM), the young Frenchman started from pole position for the final race of the weekend where the fierce opposition from Mini and his Kart Republic teammates Kimi Andrea Antonelli (KR-Parilla) and Taylor Barnard (KR-Parilla) – who won the Prefinal A – made things not as easy as planned. After a bad start, that saw him drop to P7 in the early stages, Amand was back in business on lap 4 before pulling away from the rest of the battling field. Behind, it was a four-driver show with Laurens Van Hoepen (Tony Kart-Vortex) recovering from P9 on the grid to the second position just two laps from the chequered flag. The final third step of the podium went to Saturday Heats’ leader Kirill Smal (Tony Kart-Vortex) in front of Dilano Van’t Hoff (Exprit-TM) and Thomas Ten Brinke (FA Kart-Vortex). The last lap of the Final brought its fair share of drama with Mini’ almost going off after a wheel-to-wheel battle with Barnard and Antonelli. If the British came home in sixth, the Parolin driver and his fellow countryman received post-race time penalties (wrong front fairing position) that both dropped them to P12 and P17 in the weekend’s rankings. With one win each so far, Barnard and Amand have now isolated themselves for the Final Cup title battle, separated by a small 3-point gap heading for the last round of the WSK competition in Adria, in two weeks time. The “Brabançonne”, the Belgian national anthem, welcomed a well-deserving Ean Eyckmans (Parolin-TM) who made good use of his Parolin chassis to clinch victory in the 60 Mini class composed of the youngest drivers on track. If the Belgian was starting from pole position thanks to his previous win in the PreFinal B, the first half of the 10-lap Final saw the Qualifying Heats’s leader Brando Badoer (Parolin-TM) show good pace to go from fifth to first before Eyckmans took the lead back on lap 6. But the last rounds of this hectic Final would mean no rest for the Baby Race driver as his teammate Coskun Irfan (Parolin-TM) got passed him with the chequered flag at sight. Not far behind, Badoer got into some contact to drop back to P9 while Eyckmans managed to make victory his own, a small 0.156 of a second margin in front of Irfan! Third on the line was Jamaïca’s Alex Powell (Energy Corse-TM), a satisfyingly-enough result for him to keep the rankings’ lead before the last round at Adria. Joel Bergström (Parolin-TM) crossed the line in fourth ahead of Dmitry Matveev (CRG-TM) while Badoer grabed what was left to finish seventh. 518,Eyckmans Ean(BEL),Baby race driver academy(PAROLIN/TM-RACING/VEGA), Castelletto, 11 November 2018. WSK Final Cup, © 2018, Alexandros Vernardis / The RaceBox. 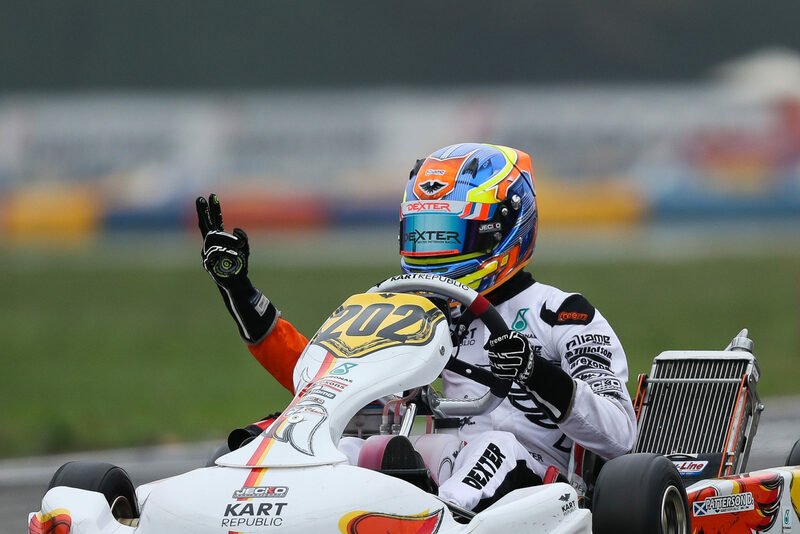 Entering the WSK Final Cup for the first time this year, Adrien Renaudin (Sodikart-TM) had made it clear about his ambitions for the victory on the 7 Laghi Kart Circuit. And the reigning KZ2 European Champion kept his word even though the path to glory wouldn’t be as easy as foreseen. Fastest in Qualifying, leader of the Heats then the winner of the PreFinal, the CPB Sport driver chose to switch front positions with his countryman Emilien Denner (Kalikart-TM) to start on the external side of the track’s main straight line. A gamble that paid off as the blue-livery machine got away in the lead at the first lap. But this Final quickly turned from a potential walk in the park to drama for Renaudin as he ran wide in the second lap to drop to P6, Denner getting ahead to increase the gap over the rest of the pack. Showing a constant pace, Renaudin recovered the lost ground and by half-distance was back in the tail of the CRG leader who would not open any door until the penultimate round when Renaudin went for the move to take back the first position. An aggressive but finally fair manoeuvre as the two leaders got briefly into contact without further damage. Adrien Renaudin kept the pace to cross the line first, less than four-tenths of a second away from Denner, whose impressive level this weekend promises a very interesting showdown for the title at the third and last round of the WSK Final Cup in two weeks. Finishing fourth was Axel Bengtsson (Kosmic-Vortex) in front of Dylan Davies (DR-Modena). With the fastest lap in Qualifying, two Heats and the PreFinal A under his belt, Lorenzo Travisanutto (KR-Parilla) seemed to be on for another shot at the victory this Sunday, two weeks after claiming Lonato’s first round. The Rosberg Racing protege had the best of start in front of his “best enemy” Nicklas Nielsen (Praga-Vortex) who had to deal with a quick Viktor Gustafsson (Kosmic-Vortex), flying from fifth to third place, while the first lap proved to be costly for Kas Haverkort (CRG-TM), dropping to P10 before retiring. Drama hit as well at the front with the leader Travisanutto slowing down in the start/finish line before retiring into the pits on lap 4 because of an electric problem. The remaining of the Final turned into a three-driver battle with Nielsen in front of Leandro Anderruti (KR-Parilla) and a fast-recovering Dexter Patterson (KR-Parilla). And the young Brit, who joined Kart Republic earlier this season, kept his momentum going to take the lead halfway through the distance not be passed again. 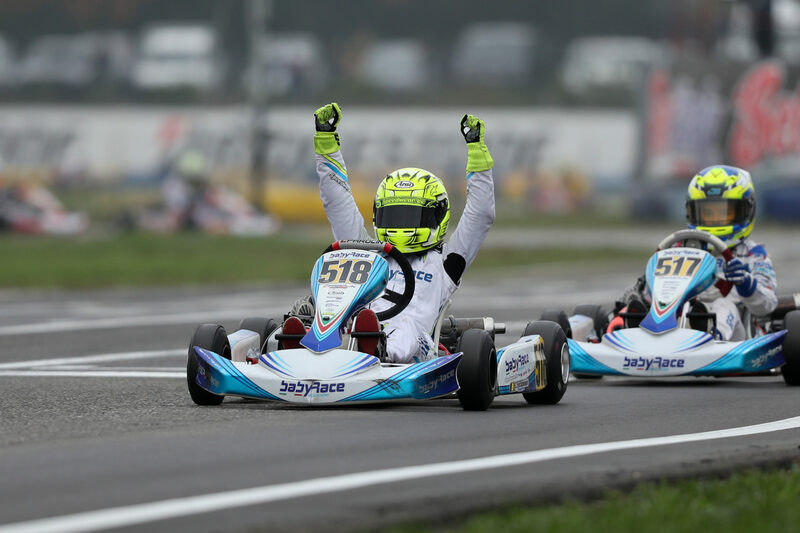 After a difficult Saturday with P4 as a best personal result in the Heats, the man from Glasgow found the right trick on Sunday to win the second round of WSK Final Cup to rise to second place in the provisional rankings behind Travisanutto. Close onto the finish line (0.130), Anderruti had to make do with the second position with Joe Turney (Exprit-TM) in third, Nielsen further back in fourth and the young Frenchman Sami Meguetounif (Exprit-Vortex) closing up the top 5. The third and final round of the 2018 WSK Final Cup will take place on the Adria International Raceway from Nov. 22th to Nov. 25th.